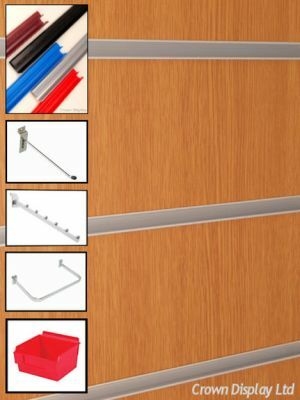 Slatwall is a multiple use shop accessory that has been around for over 30 years. First available in just 3 neutral colour finishes we now offer 27 colour options for both Slatwall panels and accompanying Inserts. 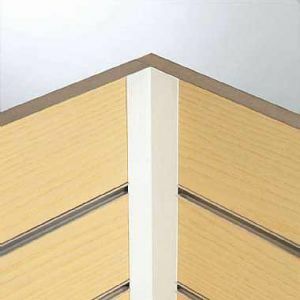 In addition our slatted wall panels offer a practical selling tool as they maximises interior selling space whilst covering any wall defective areas. When paired with Pvc or Aluminium inserts Slatwall adds to both weight holding and cosmetic appearance. 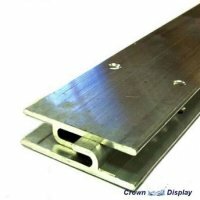 Slatwall is generally sold in 2400/1200mm dimensions although it can be cut to any size including groove spacings which are standard at 100mm but have both 75mm or 50mm options. The panels are made to18mm thickness and 100mm pitch between each slot. We only supply Grade 1 UK sourced Slatwall. Please call us Free on 0800 587 5880 with any Slatwall query. Please also remember we have a genuine best UK price guarantee on all Slatwall panels and accessories. The invention of our new easy fit wall battens make fixing slatwall a doddle. 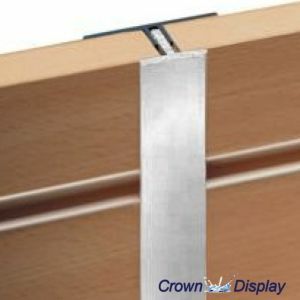 If wanting to fix direct to a wall simply gauge the quality of the wall before fixing, if felt strong enough use counter sunk screws approximately every 400mm (based on a portrait panel) ensuring that the screw head is flat and not angled allowing the slatwall insert to be pushed in easily afterwards. Remember to use a spirit level in case the wall or floor are not level when fixing. Any technical queries please call us any time on 01275 866255 where we will be more than happy to advise. 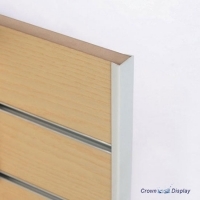 Slatwall panels provide a cost-effective, versatile solution to enhance your product display. Whatever the nature of your business may be, slatwall is an excellent option for any retail outlet - durable and attractive, it offers a decidedly professional, yet highly effective, platform for product presentation. We only sell UK sourced high grade slatwall. This reassures our customers and supports our reputation as a supplier of quality ethically produced shop fittings that are made to last. 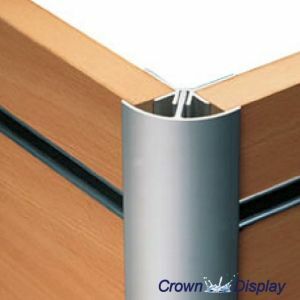 As well as being locally sourced, our slatwall is also ethically manufactured, this is a key aspect of how we work at Crown Display. All our materials are sourced from socially and ethically responsible providers that work with skilled local craftspeople wherever possible. 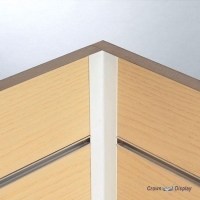 Our principle philosophy is to offer products of outstanding quality at a fair price, and we work hard to ensure that our customers can be guaranteed a slatwall panel that is strong, durable and that looks great, at the best price possible, without the risk of formaldehyde emissions (a toxic effect from low quality slatwall). 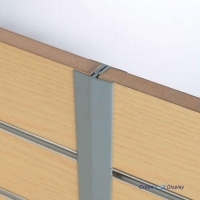 The difference between good quality slat boards and poor quality slatwall panels is visibly noticeable. However, if you’re unsure before purchasing slatwall, visit the suppliers’ premises and ask for a sample. That way, you not only establish the quality of the slats being supplied, but you can also reassure yourself that you’re dealing with a reputable business. 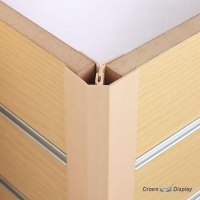 At Crown Display, we are always happy to discuss the quality and sourcing of our slatwall panels. 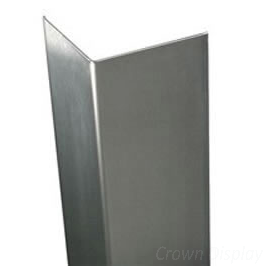 As standard, slatwall is supplied as an approximate full size 8’ x 4’ or half size 4’ x 4’ panel. However, we can cut the boards to any specific slat size for you; usually at no extra cost. We can also change the standard 100mm pitch (distance between grooves) to 50mm, 75mm or another groove gap of your choosing. 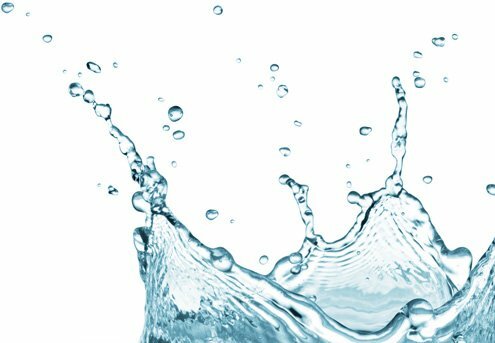 Ensuring that you have correctly fitting inserts or panels is a priority to us, which is why we can customise the size to measurements that are tailored to your requirements. 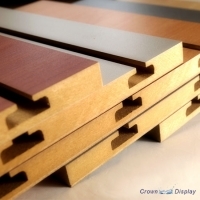 Many retailers find that a neutral cream, grey or white finish to their slatwall works best in their store, but we do offer a wide range of alternative finishes, including wood grains, such as beech, oak and ash, for an especially welcoming atmosphere, and brightly coloured finishes such as deep blue or vivid yellow for a more dramatic display. 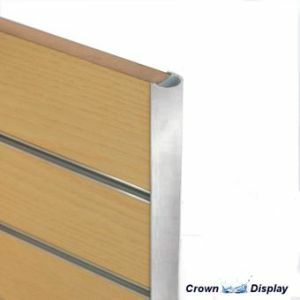 For the ultimate effect, we now also offer silver slatwall as well as acrylic mirrored panels. Our selection of coloured PVC and aluminium inserts will enhance your slatwall panels cosmetically, as well as increasing weight load. Our new reflective mirrored PVC inserts are particularly eye-catching! 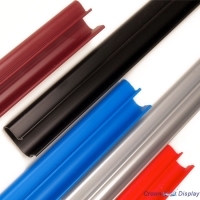 To aid installation and further enhance the display, try our range of profiles – easily fitted and available in a variety of colours. 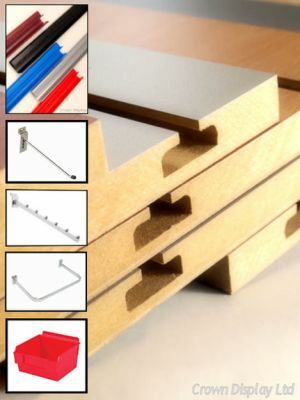 Once you have decided on the size and finish of your panels, be sure to browse our wide range of acrylic and mirrored chrome slatwall accessories. Appropriate for all kinds of products, we are bound to offer the attachments you need within our selection. 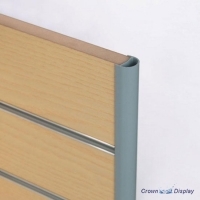 Making the most of your available wall space is easy with Crown Display; not only do we have flat fitting options, but we also have internal/external corner slatwall options, so you can carry on the system without disjointed function or appearance. Hanging all panels is simple with aluminium battens; relying on one to fix to the wall and one to bind to the slatwall panel, minimal projection from the wall occurs with maximum efficiency. 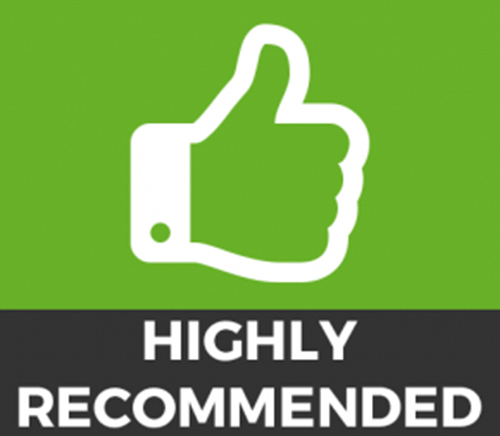 Once fitted, you may wish to reduce the risk of damage to and from staff and customers, or simply create a more aesthetically-pleasing appearance that’s to your tastes. 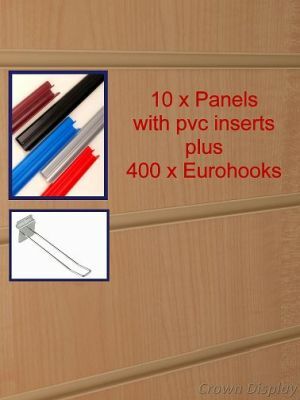 This can be achieved with our end caps or strips, as well as joining strips (also available for internal and external corners). To match your interior, our slatwall panels are available in a range of designs; from neutral hues and wood grains to vivid colours and mirrored acrylic, there’s something to suit everyone.